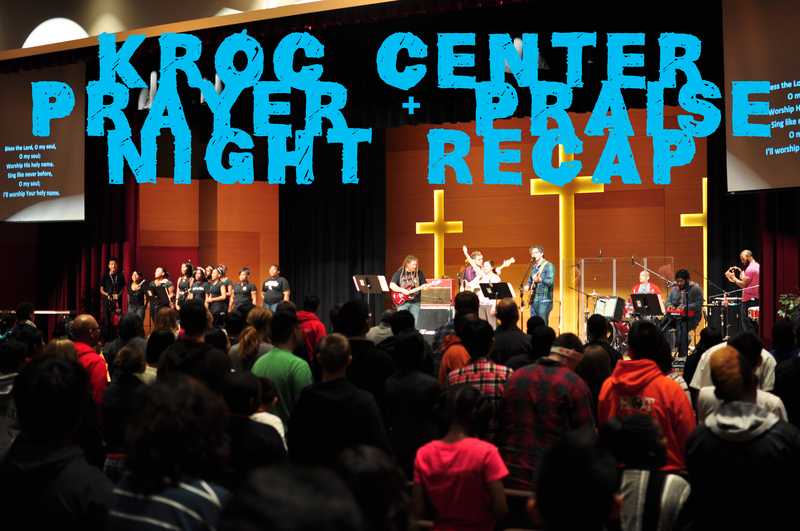 Kroc Center Prayer & Praise Night Recap (Podcast + Photos!) | Metro Youth Network | Connect. Experience. Grow. If you missed the Kroc Center Prayer & Praise Night (P&PN), then you mos def missed out on an awesome night of worship, teaching, testifying and fellowship (complete with a water park. HELLO!). Over 350 youth and youth leaders came out from 20 Corps! Praise God! In many ways, the Kroc P&PN was one of the best P&PN’s we’ve ever had before. Now, I’m going to attempt to recreate the night for you, but there’s no way I can do that perfectly. The best thing you can do is show up to the next Prayer & Praise Night (January 11, 2013 at the Rockford Tabernacle Corps), and experience first hand. The best part of the P&PN – as is the case with every P&PN – was when we got to dig into the Word of God, and hear the message. God spoke powerfully through John Kim (English Ministries Pastor at Mayfair Community Church) on sexual purity from 1 Corinthians 6:12-20. Fortunately for those of you who weren’t there, we recorded the message, and it is available online for you to hear. Simply click on the podcast player on the right on any page on our website. You can also download it and listen to it on your way to school. MULTITASKING! The Kroc Center dance teams started the night with a beautiful worship dance, and also closed the night with a slamming hip-hop mash up. There were back flips AND break dance moves! Come on, son! The folk band families played a mini set for us, and helped us see what making art for the glory of God can look like in a different way. We also had the Singing Company lead us in worship, along with the Kroc Teen Choir, and helped us focus our hearts and minds on the Lord and His glory. If you’re a visual person like me, then visual aids definitely help process things. So, again, fortunately for those who weren’t there, we have photos from the night that you can look at and comment on. Head over to our Flickr page and check them out for yourselves! Again, the best thing you can do is head out to a Prayer & Praise Night yourself. The next one is on Friday, January 11, 2013 at the Rockford Tabernacle Corps. Lt. Lorna Nelson, who went to training from the Evanston Corps and is currently at the Blue Island Corps, will be our guest speaker. You will definitely not want to miss out. Promotion will be coming out soon, so stay tuned! At Prayer & Praise Nights, youth are growing in their relationship with the Lord, and they’re being challenged to “win the world for Jesus” in a way that is relevant to their place in life. These nights are so important in the discipleship experience of our youth. We hope to see you at the next one!